There have been many computerized attempts to provide payroll accuracy. 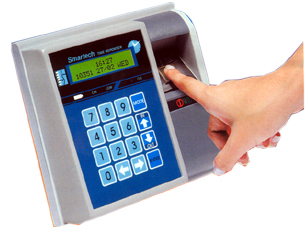 Swipe Card Systems do a very good job to minimize manual data entry errors. However, one flaw of Swipe Card System is buddy punching. You cannot be sure that the person using the swipe card actually owns it. In buddy punching, one employee punches or signs in for another that is absent. 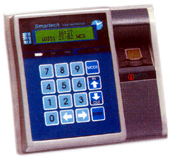 iWatch from Smartech is an unsupervised time recording system replacing your muster register / punch card / swipe card system. iWatch uses advanced fingerprint verification (biometric) of employees rather than relying upon an arbitrary card punch. Fingerprints are unique, so Smartech iWatch eliminates the ability to buddy punch—saving the company money in time theft and employee abuse. • Quick generation of reports and pay slips. Significant saving of man-hours in generation of reports and pay slips. At the heart of the Smartech iWatch is the Fingerloc ™ sensor. Developed by Authentec, and easily the most robust, durable and advanced sensor on the market today, the Fingerloc (TM) sensor uses an active antenna array, which looks below the surface layer of the skin producing an unaffected, undistorted image. Unlike other technologies, such as optical or DC capacitive, skin surface conditions such as calluses, dryness, dirt, moisture, or the effects of aging do not limit the capture ability of the sensor. Contaminants such as ink, paint, or glue have little or no effect because the technology reads below the surface capturing the user's LIVE fingerprint. The result…. A clearly superior image, which gives the capability to work for everyone- in the real world. Smartech iWatch use a new technology that reads below the user’s surface layer of skin down to the live sub-dermal layer where an individual’s true biometric identity resides. Other biometric reading technologies based on optics or capacitance do not work on up to 30% of the population due to their dependence on the surface layer of the skin. By ignoring the surface layers of the skin, and reading the live tissue down at the sub-dermal layer, a Smartech sub dermal biometric fingerprint system does not suffer from such frailties. i watch uses most robust, durable and advanced capacitive based silicon sensor which looks below the surface of the skin capturing the suer's LIVE fingerprint. Bright 16 character x 2 line backlit LCD display Display time, date, day of the week and records remaining. In case primary finger is not suitable for verification (such as when the finger is hurt) secondary finger can be used for authentication process. Besides advanced silicon sensor, iwatch uses latest high speed Digital Signal Processors to provide quick identification / verification. Displays messages and greetings for all employees, or even for a single employee exclusively*. Displays messages and greetings for all employees of even for a single employ exclusively. Time Reporter's Non- volatile memory retains recorded data for over ten years. The inbuilt smart UPS works in spite of power failure, and switches off automatically if the unit is idle for more than two minutes to preserve battery life. Before an employee can use iwatch, they must be registered so that the reader can compare attempts to sign in and out with a master record that authenticates the person. Registration on iwatch is very simple and it takes less than a minute. Even though iWatch is primarily designed for time recording applications, it can serve additionally as a single door access controller. 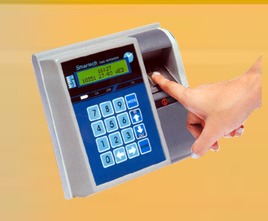 This feature allows a convenient combination of time recording with access control. The terminal can also handle a door sensor and an emergency exit switch. i watch - Identify search for a matching template with in a pool of templates This allows an individual to be unquely recognised without having to enter the identity by a second means. 1. 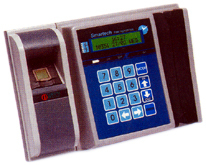 Programmable siren & door control. i watch -verify confirms the identity of an individual once the individuals ID number has been input via a keyboard or swipe card.